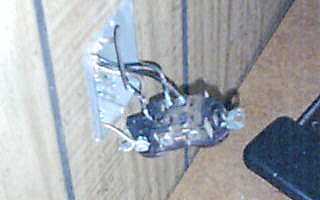 This pic was taken after I had merely removed the 6-32 screws and pulled the receptacle from the box. The "white" wires dislodged themselves, I did not remove them (and yes, they aren't very white anymore). To describe the picture in an effort to make up for the lack of resolution, the conductors were back-plugged #14 which had turned green due to corrosion and black due to heat on the bare copper, and with very charred insulation. This was the first receptacle in line that eventually fed a 15A Air Conditioner, with a very charred plug. The A/C was dropping the voltage down to 98V at the Receptacle that it used after the repair on the first one, so I will be replacing all receptacles in this mobile home. The switches aren't back-plugged, and seem to be in decent shape. After I had pulled the receptacle, I had asked the owner's permission to take the picture, and had explained the problem (which didn't take much convincing... the service call was "my outlet sparks when I push on the wall"). I also showed her the new receptacle with holes in the back, and I told her that ironically, it is still an accepted practice. Her response? He also drove a Ford Pinto. I understand from my reading that aluminum wiring was quite popular in homes for a while over there. Late 1960s/early 1970s ? It never really caught on over here, not in smaller cables for residential anyway. Probably a good thing from what I've heard. Isn't that the model that had the badly positioned gas tank that got hit in rear-end shunts? Yes, the Pinto was the car with the gas tank that would explode upon rear impact. I actually saw this happen up close. Bad scene. Instant fireball, no chance for anyone to get out. You find some great photo opts!!! Keep up the good work!!! Do you suppose the AC at the end of line was the cause of these failures?? where are the posters who defended this practice in the thread we had a few months ago? I hope this makes them reconsider.